I've had a terribly busy week and haven't spent as much time in the sewing room as I'd like, but I did manage to get my Paintbox quilt-along blocks done for the week. Purples! Here's my stack so far. 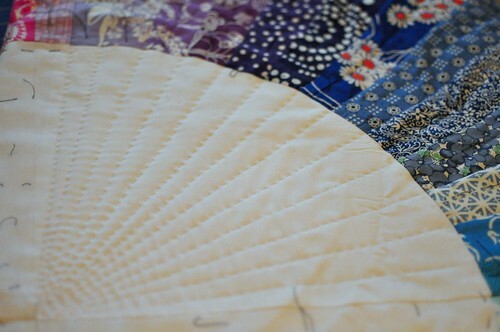 I can't wait to finish this quilt. Only three weeks to go in the quilt-along! 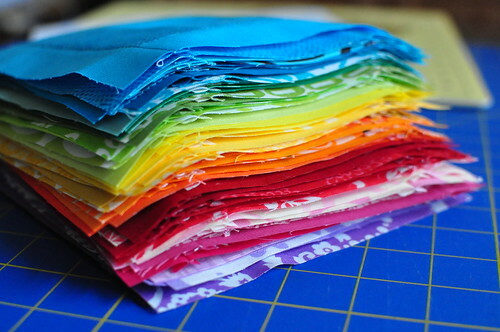 I've been working on the Color Wheel quilt as time allows. My hand stitches are much too long, but I'm giving myself some slack since it's my first try. The stitching is really dense in the center, and it's taking me longer than I expected to see some progress. 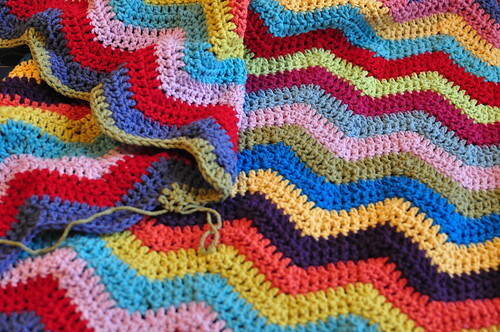 I've also been working on the ripple afghan. It's portable, so I have time to work on it in the car when my hubby is driving. I spent some time with my Papaw yesterday. He's a WWII veteran (Pearl Harbor) who will be 91 this summer. He grew up on a farm in central Texas with three brothers and four sisters. We talked about his memories of his mother quilting when he was little. He said she'd sit for hours and sew fabrics together by hand and that she used big frame for quilting. When I asked him if she used feed sacks in her quilts, he said she would cut them open and piece them together for the backs, either that or use old blankets. 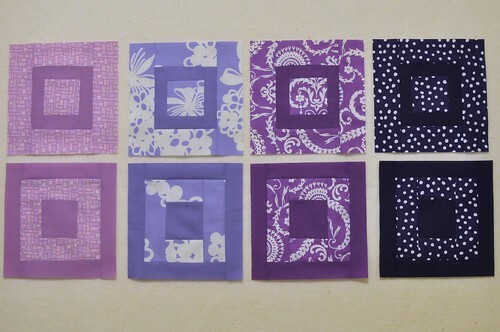 He remembers going to a nearby dress factory and buying big bags of fabric scraps which she used for the quilt fronts. I've also read in information complied by other relatives that she loved to crochet. He name was Mamie. She was born in 1897 and died a few years after I was born. What I wouldn't give to have one of her handmade quilts now! I wonder if any of my quilts will be around in 90 years? I wonder who will have them? Will my daughter have stories to tell her grandchildren about my love of making things? I hope so. You are very busy!! Everything looks great. I love the story of your day with your grandfather. It is too bad you don't have any of your grandmother's work. I know you would just cherish them all. I love love love your blog. just thought I'd say hello! Wish I could participate in the quilt along but I just relocated overseas and sadly my fabric came along but the sewing machine stayed behind. Hoping I can find one here soon! so many great projects! i love you colorchoices and especially the hand-stiching - amazing!